After gloriously sleeping in until the late hour of 7:30 am, we enjoyed our first real breakfast of the trip poolside with the company of four warthogs foraging along the river nearby. It felt quintessentially African. Shortly after, we started packing up for our two night stay in Livingstone, and debated how we were going to get from the Botswana border, across Zimbabwe, and into Zambia. And no, we did not plan this tiny travel detail in advance. I was worried that there would not be any taxis on the other side of the border in Zimbabwe. From the map it looked like a pretty empty town other than the immigration office. I would rather have taken a taxi to the river crossing in Botswana and taken the ferry over to Zimbabwe, docking in a bigger town where there might be more taxis. Adam thought the wait for the ferry could take forever since we had heard it wasn’t the most reliable mode of transportation from other travelers. He felt that the most efficient/cheapest way was to grab a local taxi in Botswana to the border for about two dollars, and then find another taxi on the other side to take us to the Zimbabwe/Zambia border. I worried about this route, but I received some reassurance from our hotel manager. I was surprised to find another taxi driver waiting on the side of the road as we pulled up to the Botswana/Zimbabwe border in the local taxi. We were in luck! He walked us all the way to the office and Adam asked him his rate. I handled our visas and payment while hoping the border patrol agent would give me a matching amount to what the driver had told Adam. Needless to say, I don’t think we got ripped off! It was about an hours drive between the Zimbabwe and Zambia borders, and once we entered through the Zambia border, it was only a short walk to our hotel. Finally passing through the Zambia office, we were immediately harassed for taxi service to our hotel. “No thank you. We’re good” we repeated. We picked this hotel specifically for its walking distance to the waterfall. One driver wouldn’t take no for an answer and insisted on walking with us for the price of three dollars!!?? Some things you just can’t argue with or understand when in a foreign country. I will admit he knew more about American presidents than either Adam or I had ever committed to memory. In our defense he was apparently studying world history–scary how many of our US presidents factor into that, right? We arrived at our hotel a little sweaty from carrying our packs. 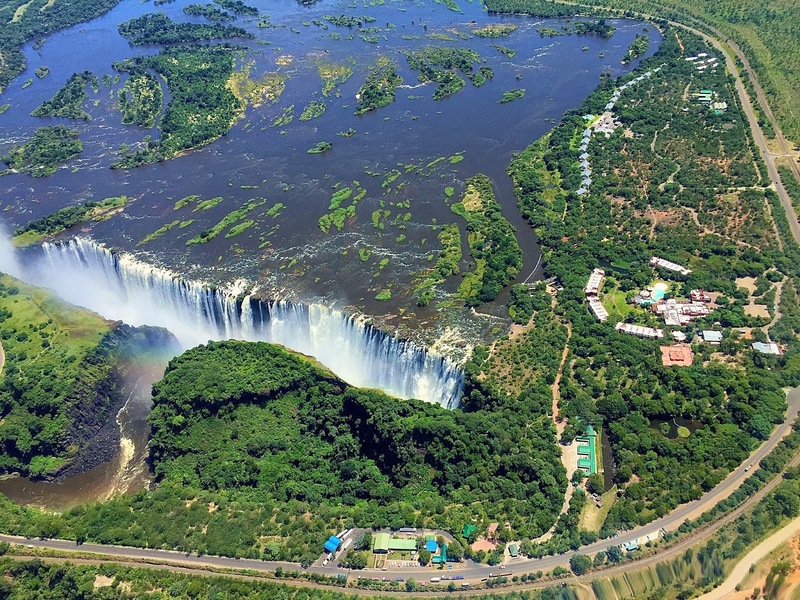 In Zambia, we opted to stay at the Zambezi sun because of it’s proximity and private entrance to the national park where the falls were located. Unlike the Chobe National Park where you paid a daily rate, this park charged twenty dollars every single time you entered. We were getting the convenience of being able to walk in and out of the park as many times as we wanted without having to handle a transaction. It also gave us a place to unwind and relax before we headed back home. We were greeted with two refreshing glasses of iced-tea and were promptly carted to our rooms. Yes, they even served sweaty backpackers! We may or may not have had to shoo some zebra away from the path to our room. They’re just like horses! We dropped our bags and immediately took the footpath right by our room to check out the falls. We only stopped at one or two lookouts before heading back to the pool. We wanted to save the BIG stuff for our chopper ride tomorrow! I was in heaven. The sun felt so good once you had taken a dip, the gin and tonics were dangerously cheap and quickly replenished by the pool staff, and the zebras just roamed around grazing nearby. It was nice to stretch out and relax after being cooped up in planes and cars for the last five days. We decided to explore the sister hotel connected to ours by the same footpath that led to the falls. 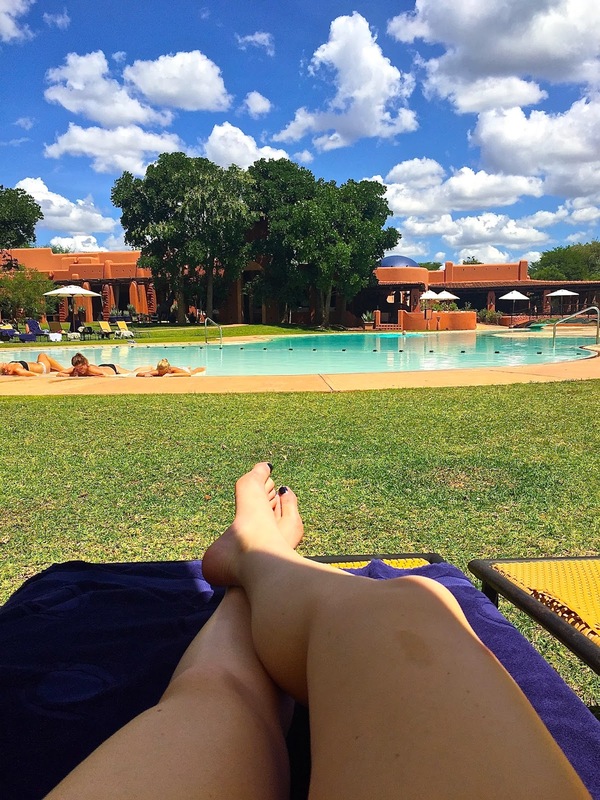 The Royal Livingstone Hotel is a step above most hotels I’ve experienced. Our favorite part was the river deck bar. We enjoyed a few sundowners here while watching, what else, the sun go down and the mist float above the falls nearby. 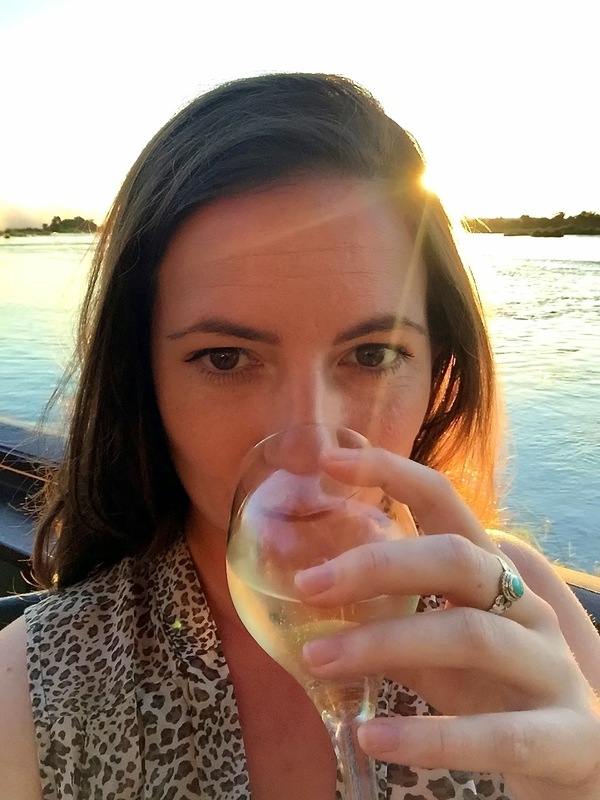 It was a great way to spend a relaxing evening after trekking around Chobe for the last 4 days! I highly recommend visiting this hotel for a little dose of luxury if you’re in the area. I can only imagine how nice it would be to stay there if you could afford the price-tag. We liked it so much that we decided to check out the bar menu in the hotel after the sun went dow. 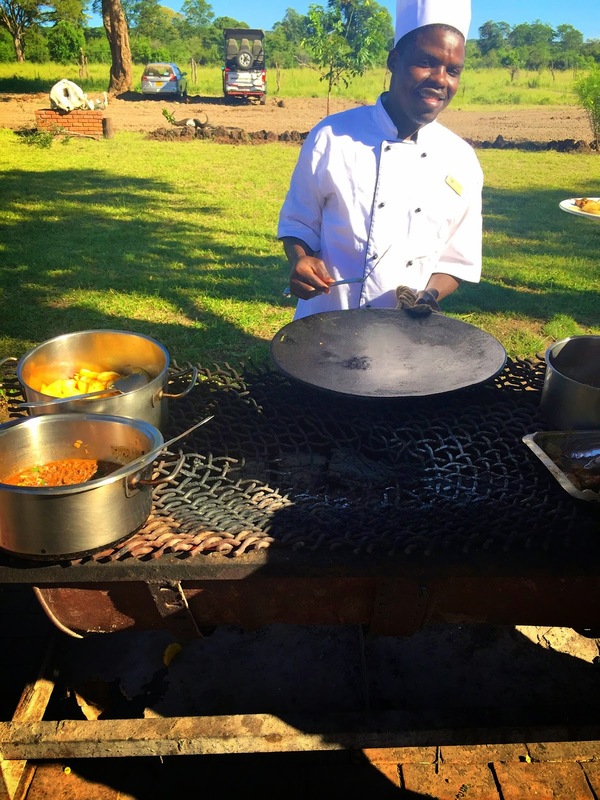 We munched on some delicious cuisine while rocking our chairs on the wraparound porch, also overlooking the Zambezi river. We were once again ready for another early day! The next morning we made our way to the Zimbabwe border where we were picked up for our first activity with Shearwater Excursions. We were going on an elephant safari in the Stanley and Livingstone Private Game Reserve. Since it was the off season, it was just Adam and I on the tour. This is Tatu, the matriarch of the herd. She was very sweet and her Induna (or caretaker), Tom, was sincere and very informative. You can see how long her eyelashes are! The hair that grows out of their thick hide is stiff as needles. So weird! And the trunks are so strong that when I fed Tatu it felt like (and sounded like) a vacuum against my hand. These beautiful animals were so amazing to encounter up close and personal. I really felt like I got to bond with Tatu. Tusker led us through the bush since Tatu wouldn’t go in front of him. The matriarchs typically follow in the rear so they can watch over the entire herd. I thought that was sweet. My favorite souvenir of the trip was a stamped footprint of Tatu’s left front foot. Their footprints are as individual to them as our fingerprints are to us. This was such a cool experience! After feeding the elephants and saying goodbye, we washed up and had breakfast al fresco on the private game reserve. YUM! We were well fueled for our helicopter ride! Seeing the falls from the air is a MUST. 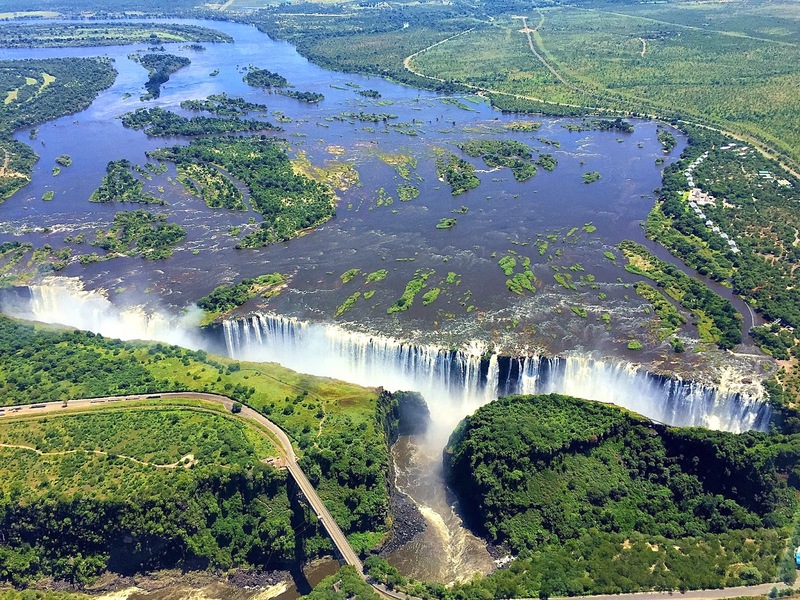 You can’t really imagine the shear vastness off Victoria Falls until you’re floating above it. It was a bit of a splurge, but because we booked it through the same company as the elephant safari, we were able to pay for it as a package and received a discount. 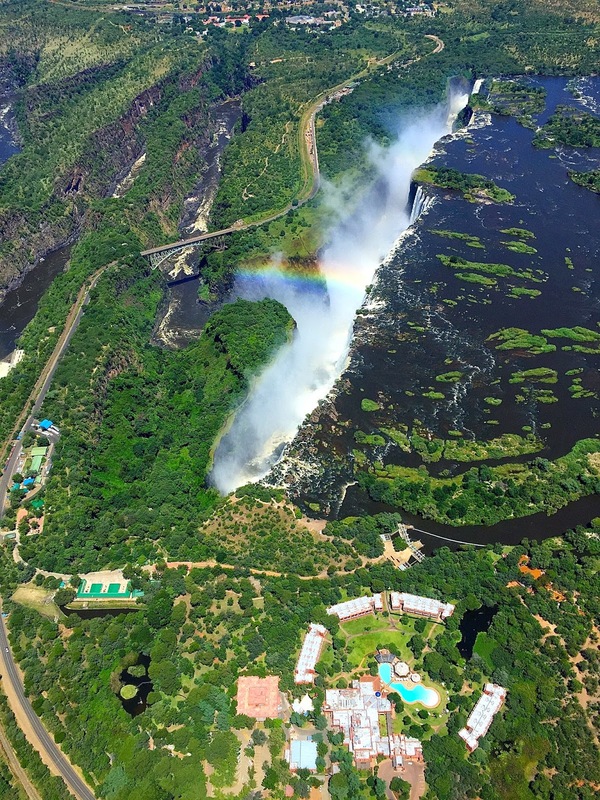 There is a constant cloud of mist hovering over the falls from the force of water hitting the Zambezi River. You can see (and hear) the cloud from the banks of the river constantly. 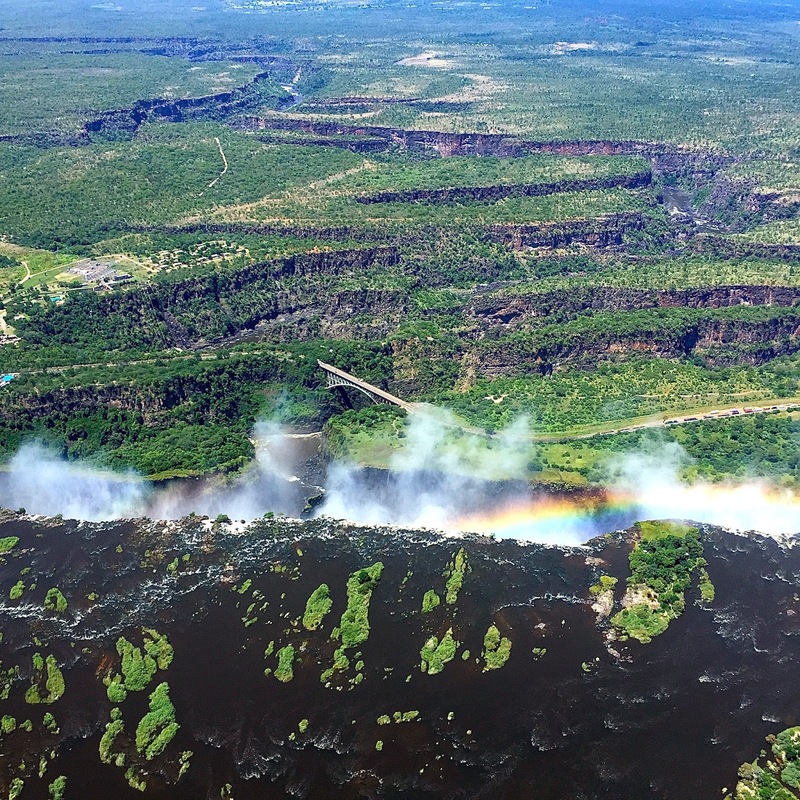 The name of the National Park where Victoria Falls is located is Mosi-oa-Tunya which roughly translates to “the smoke that thunders” or “the cloud that thunders”. Clever! ^ See those buildings and pool at the bottom of the photo? That was our hotel! 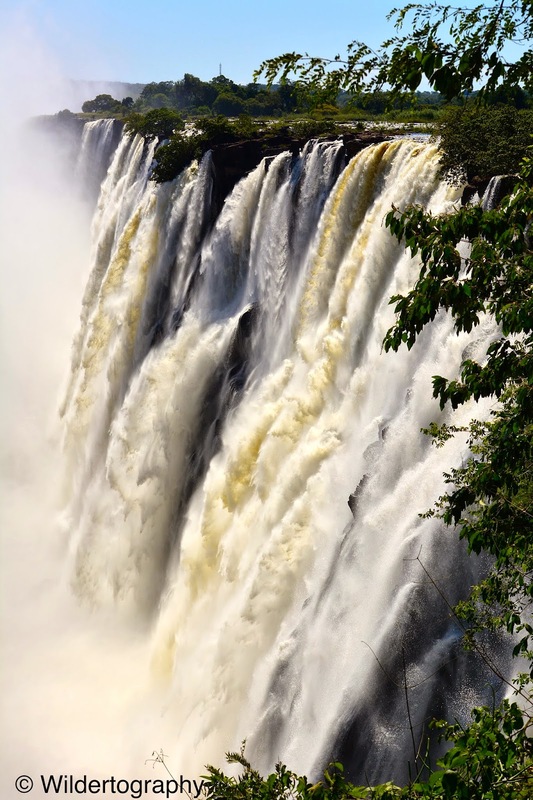 I would strongly suggest viewing the falls from the ground as well–it’s another experience entirely! 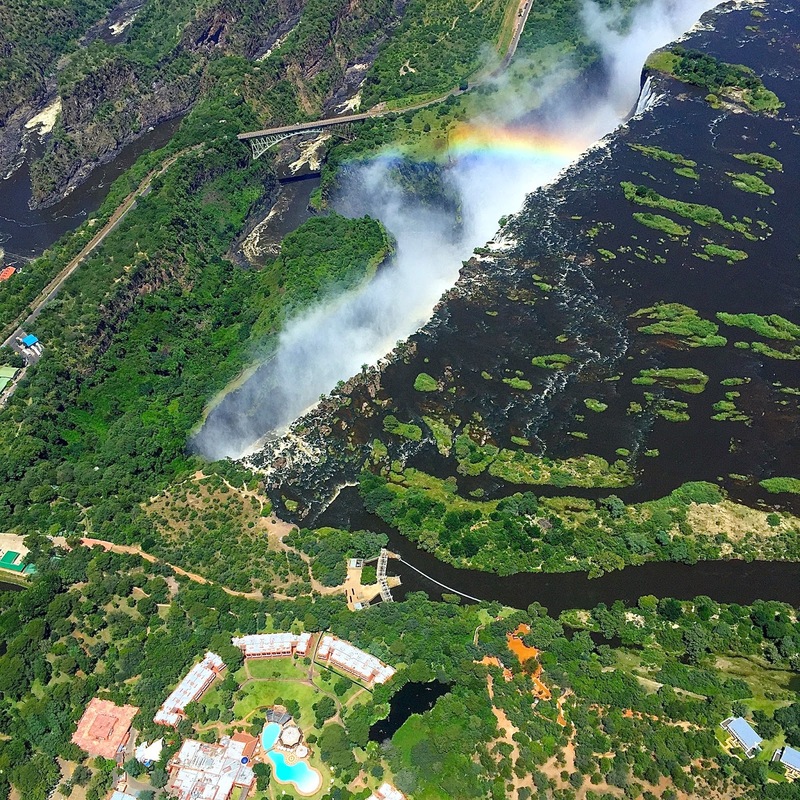 Seeing them from the air, and then back on the ground really gives you the full experience of Victoria Falls. It’s hard to comprehend the sheer size of the falls when standing right in front of them, a feeling I only really grasped in the air. All of my five senses were entirely consumed when I was standing on that bridge sopping wet and lost in the noise. The smell and feel of the bursts of rain, the roar of the falls, and the bouncing colors of the rainbows all overwhelmed me completely. 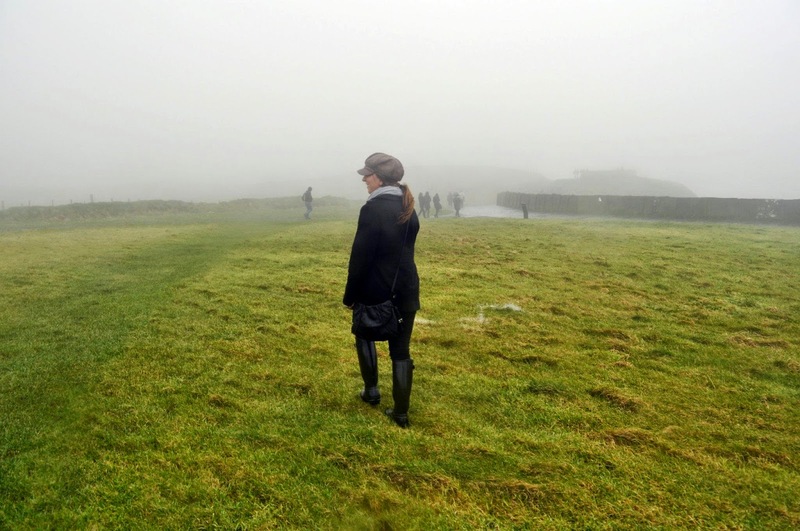 I felt like I was on another planet or something, just standing in this giant cloud of mist… It was so beautiful it didn’t feel real…dare I say it felt magical? 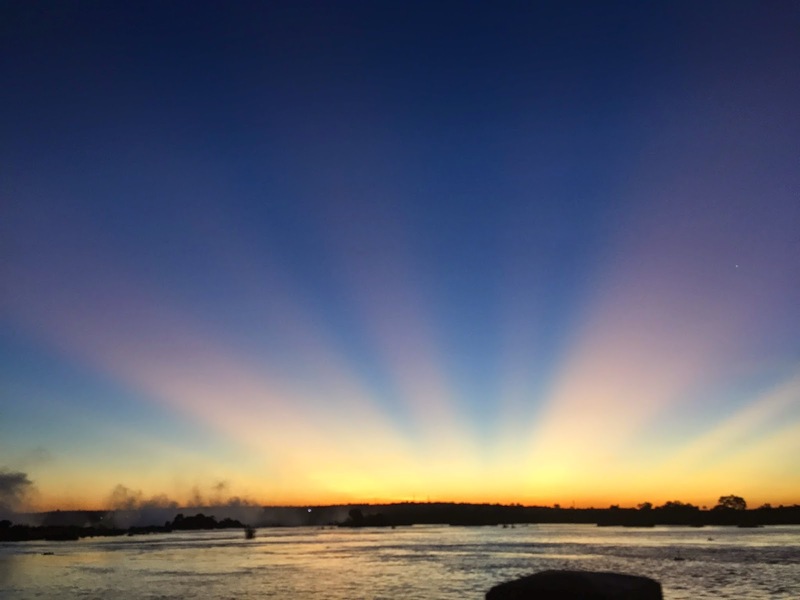 A view of Zimbabwe from Zambia. These photos don’t do Victoria Falls justice! Adam and I were so grateful to experience Africa. We celebrated (we seemed to do that a lot huh?) our final night back at the river deck bar for our last sundowner. These will always be my favorite African tradition! Our flight out of Livingstone wasn’t until 1pm, so I got to sleep in! Sleep was not a big theme on this trip so I took full advantage. 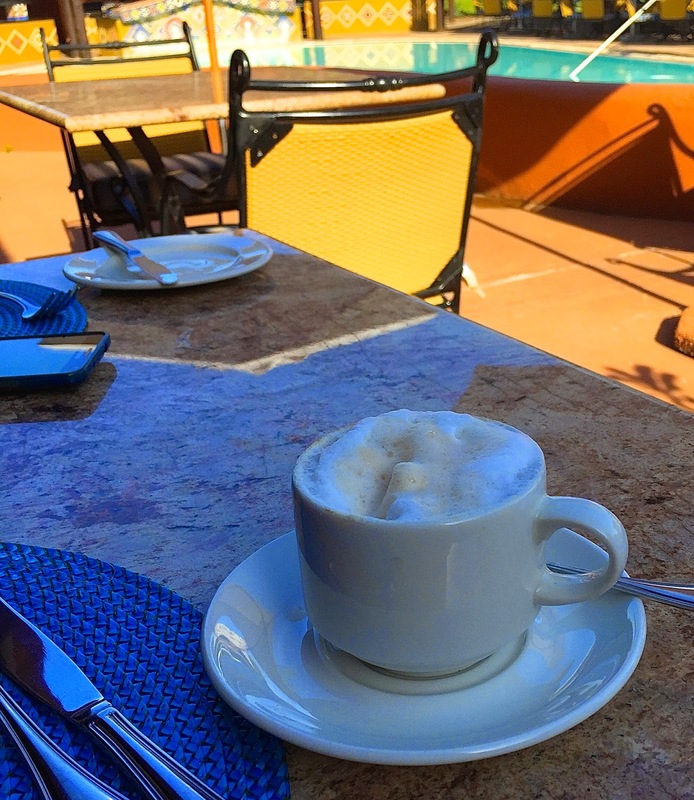 And I of course, treated myself to a farewell cappuccino. We were so sad to leave! I think I left a piece of my heart in Africa. Have you been to Africa? Any tips? Where is the coolest place you’ve travelled too? Leave comments below! 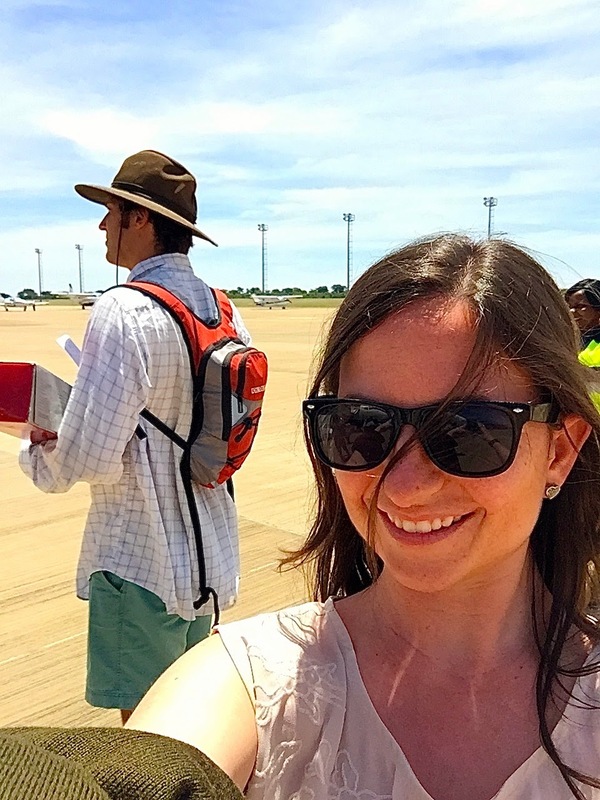 If you liked this post, you can find Part 1 of my trip to Africa here ! As always, thanks for reading all about my trip to Africa!